For a moment, the camera shows an inflatable boat, bobbing in the water near a remote Pacific coral reef where Kelton McMahon ’05 does fieldwork. Then the camera drops into the clear blue water, revealing the subject of his research: hundreds of grey reef sharks and blacktip reef sharks, each five to six feet long, swimming together in massive schools around the reef. 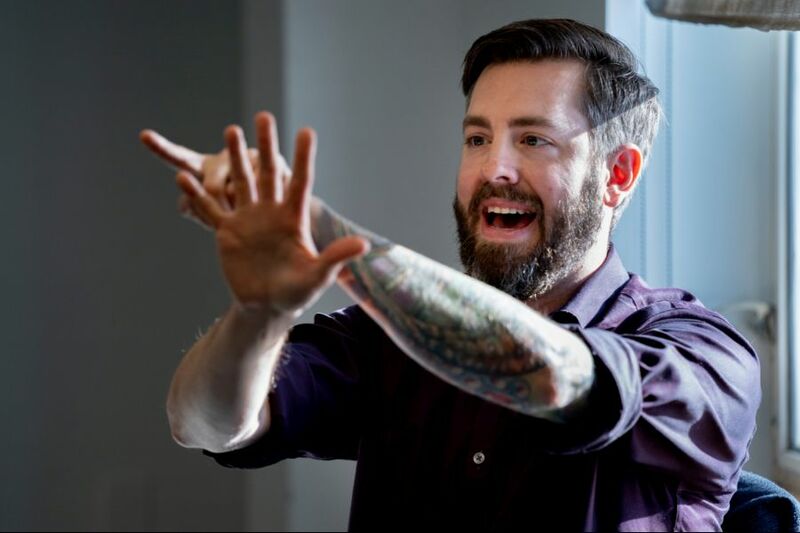 McMahon, an assistant professor of biological oceanography at the University of Rhode Island, showed the footage during his Jan. 14 talk at Bates because it was awesome, yes, but also because it represents a paradox first noticed by Charles Darwin aboard the HMS Beagle in the 1830s. 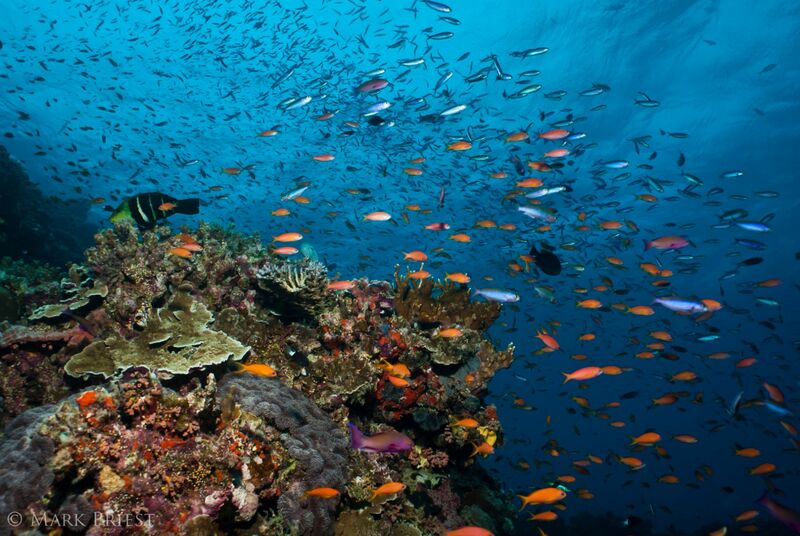 The paradox: Since Pacific coral reefs are in the nutrient-poor open ocean, there shouldn’t be enough food for two species of apex predator to coexist in such big numbers. In other words, “How can coral reefs be so productive and biodiverse with a backdrop of such low nutrients?” McMahon said. McMahon was the first of several scientists Associate Professor of Biology Larissa Williams invited to campus this semester, to speak with the students in her junior seminar and then give a public talk. 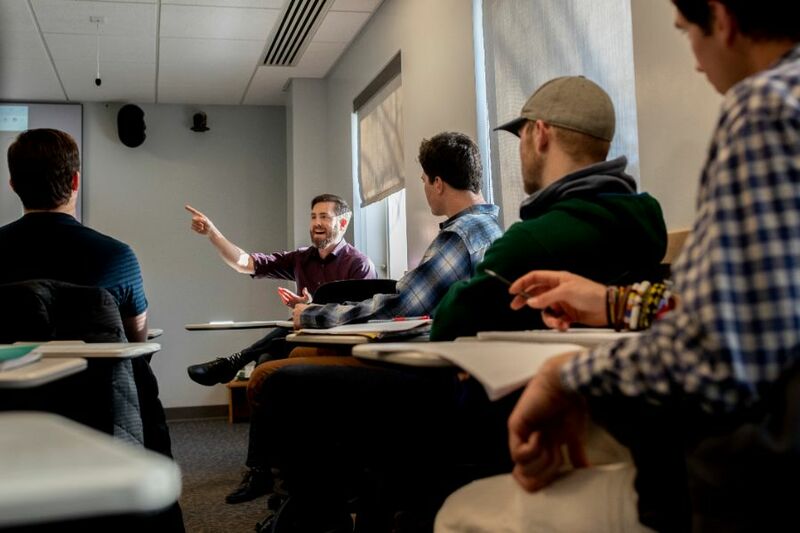 Williams’ class is a Purposeful Work infusion course, where students learn about ways they can take course material into the real world. McMahon is an ocean ecogeochemist, a title that suggests the depth of his interdisciplinary work. Over the course of his career, he and his colleagues have been developing and applying a suite of geochemistry tools, collectively called compound-specific stable isotope analysis (CSIA), that help scientists understand food webs better than ever before. McMahon told his Bates audience about two of his current projects, which apply CSIA to real-world problems. Trophic level: A living thing’s place in the food chain. For example, plants are at trophic level 1, herbivores are at trophic level 2, carnivores that eat herbivores are at trophic level 3, and so on. Producers/consumers: Producers are organisms that make their own food, as plants do through photosynthesis. Consumers get their food by eating other organisms. Amino acids: The compounds that make up proteins — essential for life. Isotope: Atoms of a given element with the same number of protons and electrons, but different numbers of neutrons. An atom of carbon-12 has six protons and six neutrons (light carbon), while carbon-13 has six protons and seven neutrons (heavy carbon). Isotope analysis: Measuring the ratio of heavy to light isotopes in a sample, which provides a chemical “fingerprint” of physical, chemical, and biological processes that have impacted those atoms. For example, by measuring the isotope ratios of a piece of shark muscle, we can understand how energy moves through a food web, from coral at the bottom to shark at the top. Scientists have used conventional “bulk” isotope analysis for decades, but it has its limitations, McMahon said. The bulk method gives you the average isotope value of all the atoms in an element in an organism. It doesn’t distinguish whether an isotope of carbon, for example, came from one or another compound in the body of a shark. That means a lot of detail gets lost. “All the different compounds in the body tell a different piece of the story about how organic matter is made by primary producers and passed on to upper trophic level consumers through the food web,” McMahon said. As a result, if you sample two animals and get back different isotope ratios, it’s difficult to know why. It could be because the animals have a different trophic position — they feed at different levels of the food chain. Or it could be because different producers are at the bottom of each animal’s food web. Or it could be a combination of both. Sharks! Watch this video clip of sharks swarming in the waters near the Phoenix Islands in the South Pacific Ocean. Video by Camrin Braun. In other words, McMahon said, you can’t figure out who’s eating what at what time. 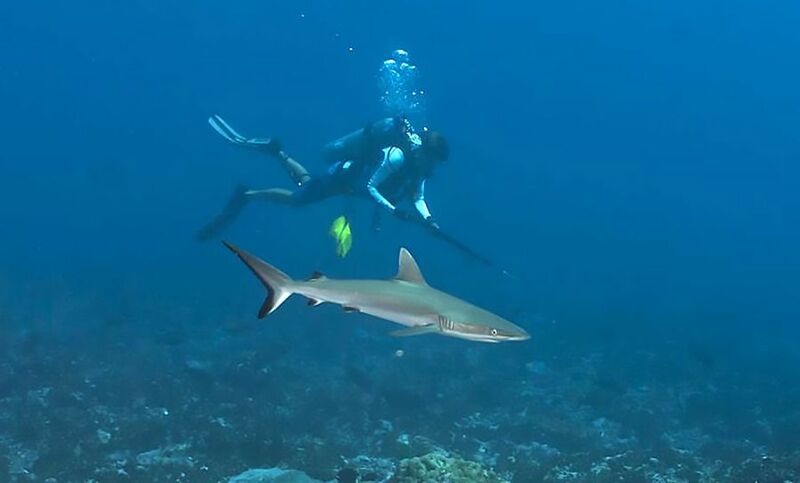 CSAI can help, as McMahon and his team demonstrated by sampling grey reef sharks and blacktip reef sharks who live near the coral reefs around the Phoenix Islands, a 10-day boat ride from Hawaii. Over the course of several years and many controlled feeding studies — where scientists know the isotope values in both the food and the consumer — McMahon and his colleagues figured out that certain amino acids, called “trophic” amino acids, change their isotope value as they move through the food chain, whereas other amino acids, called “source” amino acids, stay the same from phytoplankton to shark. By measuring the changes in trophic amino acids as they move up the food chain, you can find an animal’s trophic level, McMahon said. CSAI can also reveal how an amino acid was made — important, since different producers like coral and phytoplankton make the same amino acids in different ways. So, using a single analysis, McMahon can determine how many steps removed an animal is from the bottom of the food chain and identify the isotope signal at the bottom of the food web. For years, oceanographers thought that grey and blacktip reef sharks coexisted because they fed at different trophic levels. CSAI, however, revealed that even though the sharks are similar in size, swim together, and both eat a variety of smaller fish, they feed in two totally different food webs. The base of a grey reef shark’s food chain is largely phytoplankton, which exist in the open water. Blacktip reef sharks, on the other hand, rely on a food web with corals on the reef itself at the base. “It’s this compartmentalization of the food web, the division of resources, that’s helping promote the coexistence of these apex predators,” McMahon said. CSIA can also tell us about the effects of climate change, McMahon said. In January, he’ll return to Antarctica — one of several Bates alumni who conduct research there — to continue a study on how climate change and human activity, like past whaling, affect the lives of penguins over the course of hundreds or even thousands of years. On the Antarctic Peninsula, his team will take feathers from living penguins and also dig penguin tissue out of the ground, searching for samples that show what penguins were eating throughout the last 10,000 years. CSIA helps scientists trace the past, McMahon said, but it could also afford a view forward. “By exploring how past ecosystems responded to disturbance, we can begin to predict how the food web supporting these penguins in the future will change, in response to, say, continued warming,” McMahon said.